I’ve been out sick this week, which is no fun. I’ll spare you the details, but let’s just say it’s bad enough to get me doctor’s notes excusing me from class for the week. It’s been tough keeping up with my classes, without actually going to class, and I still had some catching up to do this weekend. I’ve continued to learn that germs spread just as easily in college (and especially in college dorms) as they do in pre-school. Gross. It’s near impossible to steer clear of all the bugs that go around. While I’m sick, I learn to appreciate how nice it is when I’m healthy and able to be active and carry on with my normal routine. Like I talked about when I got sick (with a case that turned out to be bad allergies…) earlier this school year, it’s in these times that I have to accept that my body has limits and needs rest to recover. I manage to get sick at the most inconvenient times, and it turns in to the “why me?” game that I really don’t like to play. I’ve admitted defeat to the sickness this week, and have been doing my best to take it easy and get the rest I need. On the bright side, the extra time to rest gives me extra time to relax with worship music and to reflect on just how great our God is! I pulled a scripture that’s fitting for my sickness this week. 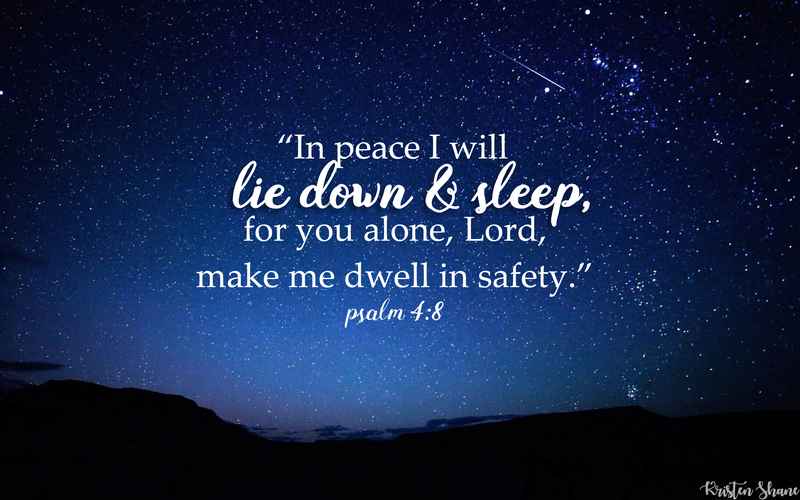 No matter what happens, we are always safe in the Lord, and He’ll watch over us in our sleep. Sleep is such an important time for our bodies to rest and heal (and I’ve got my fair share of it this week!). It’s never easy being sick, and it’ll never be convenient, so I’m making the most of it and doing my best, as always. This week, I’m praying for peace of mind and a speedy recovery! So grateful for Jehovah Rapha! Rest, Kristen and get better. Listen to your body.